C-4 Ocean Lakes. Location, Location, Location! 5 bedroom 100 ft. from beach! Spacious OCEAN VIEW HOME (100 feet from ocean!) in the best location in Ocean Lakes! Our home is in the absolute ideal location in Ocean Lakes...100ft. from the beach and 700ft. from the pool and entertainment complex!! You won't need to drive or rent a golf cart to get around when you stay in this prime location. Additional photos and information is available via email or phone. Our personal vacation homes are just steps away from the ocean, playgrounds and basketball court, 1 block away from the Olympic-size outdoor pool, 3 kiddie pools and all new 'Splash Zone' (water canons, walk through water fall, water sculpture...fun, fun, fun!!) all-season indoor heated pool, and 'activity central' recreation center with game arcade (refund tickets for prizes), 18 hole miniature golf, summer kids camp, snack bar and pool side veranda. WIFI is provided in the homes. Use your computer on our HIGH SPEED connection to surf the web or stay in contact VIA EMAIL. We update our home on an annual basis and keep it in the best of shape. You won't be checking into a run-down beach house with used furniture when you stay with us! Why stay in any other section of Ocean Lakes when you can stay in the best!! views from jacuzzi and KING BED. grilling station, and outdoor private shower facility. * Large fully-equipped custom designed kitchen the cook will love! *2nd story deck accessed by the upstairs queen bedrooms with great ocean views. *2 bunk rooms sleeps 10 kids! 1 Master queen bedroom on 2nd floor with large bay window and large ocean view balcony. 1 Queen bedroom on 2nd floor with large ocean view balcony. 2 full baths on 2nd floor with common entrance from hallway. 1 1 full bath on 1st floor with common entrance from hallway. Activities for kids, teens, and adults organized by Ocean Lakes staff, arcade, basketball, biking, bingo, boating, famous mile long 'Grand Strand' beach with life guards, chair and boat rentals, crafts, children's day camp, outdoor concerts, dancing, fishing, general store, three snack bars, nature center, horseshoe pits, shuffle board, miniature golf, oceanfront pavilion, golf cart rentals. There are indoor and outdoor pools with life guards, FREE swimming lessons, two kiddie pools, one of which is the Splash Zone' equipped with water cannons, water fall and sunny or shady spots for mom & dad to lounge, three playgrounds, ping-pong tables, indoor recreation center, beach volleyball, church services, guarded front gate, 24-hour security patrol, and ten m.p.h. speed limit! All of these features are available free of charge to renters!! Ocean Lakes has a car tag fee of $10/night/car which gains entrance to the park for all the amenities! The waterpark is amazing! Brian Dwan We've been enjoying Ocean Lakes for years! We try to get down as often as possible and truly enjoy the peace and tranquility the beach has to offer. We love to walk on the beach in the morning down the restaurant on Surfside Pier and have a coffee and breakfast. We usually go to Murrells Inlet and enjoy the restaurants and especially the boardwalk along the coastal marsh. An evening at Boardwalk at the beach is always fun, especially on the night of the week they have fireworks! This is a wonderful location close to the beach, pools, and playgrounds! We feel safe at Ocean Lakes with full-time security and 10 mph speed limits. 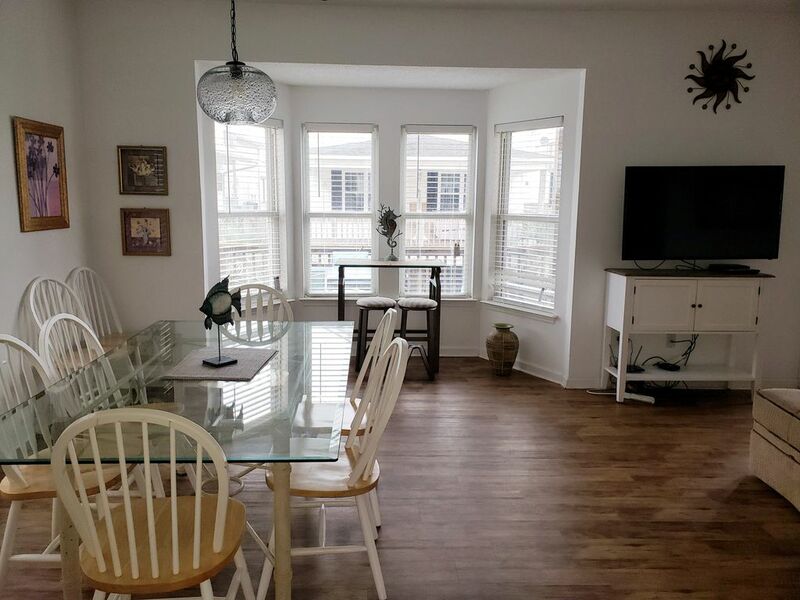 We also prefer to be on the south side of Myrtle, as this is close to the communities of Surfside Beach, Garden City Beach, and Murrells Inlet. Less crowded, quaint beach communities with an old-time feel! This home is quiet, but close to all the fun! Our home is much quieter than the ocean front homes, and don't have the problems with the traffic. 100ft. from the beach without the conjestion that comes with ocean front. You can hear and see the ocean and beach from the home. Ocean and beach views from decks and home. large decks with ocean views! 5 pools including olympic size and kids 'splash zone' with water canons, water fall and other fun kid approved features! Lovely place close to the ocean and pool. Great for multi family. Owners were awesome to work with. We are so glad you had a great vacation! October is such a wonderful time at the beach. We hope to see you again, you were such great guests! We enjoyed the convenience of staying in close proximity to the beach, local pool and water attraction. The house was beautiful, spacious and comfortable. Whether we wanted to speand the whole weekend outdoors or indoors, we'd still love every aspect of the house. We will absolutely stay again. We are so glad you enjoyed your vacation. It was such a pleasure hosting your family. Thank you again for leaving the home so tidy! We hope to see you again in the future. We loved the house which is in a Perfect location. The owners were Awesome to work with! We had the whole family with mixed ages. The house was spread out enough for the teens to hang out on the balcony. Kitchen is fully stocked and easy to cook in. Bedrooms were awesome and beds were comfortable. Being so close to the ocean was a bonus. Little ones took advantage of the day camp which gave Mom a break. Owners were very accessible and helpful! Can't wait to go back! We are so glad you enjoyed your stay and the home! It's so much fun to be close to all the activities, pools, and ocean. We really enjoyed speaking and working with you too! We would love to have you come back and visit again soon. The house is in a wonderful location in Ocean Lakes. We could easily walk to the beach, pool and activity center. This made it great for going on the beach and coming back in to enjoy lunch or go to the pool. Vicki was very great to work with. Anytime I had a question she was quick to respond and take care of any of my concerns. The house needed a deep cleaning. The shower tubs had dirt and grime in them, we found items from previous guests left under beds and the house was coated in dust. The air vents were in need of changing. When you pay a cleaning fee to stay at this house, you should not have to come in behind and clean before getting to enjoy your vacation with your family. The door to the dryer was broken, the faucets and shower heads were not working properly, one of the shower tubs was clogged and therefore would hold water while trying to take a shower. The ice maker was broken and one of the brackets holding the hand rail on the stairs was broken. I did contact Vicki with some of these concerns and she said she would have someone come and do repairs. I understand that homes have general maintenance issues; however, when you pay the price to stay in this home I feel like these maintenance issues should have already been addressed. Overall, we were very disappointed in the house but did love the location. Glad you enjoyed the location of the home. You just can't beat the close proximity and views of the ocean you get when staying in our home just steps from the beach. The homes in Ocean Lakes do get dusty and sandy, especially in the busy summer season up front and close to the beach. Our cleaners are always available if renters find any areas needing attention. We have our maintenance man also on call to fix any issues renters may have...all you have to do is call. The only way we know of broken items is when notified by renters. We can't fix what we don't know is broken. All issues this renter had with the home were taken care of as soon as they were brought to our attention. We have operated this home for numerous summers with virtually no issues. Most renters understand that there will be some from time to time. We always reply promptly to any issues renters may have. I must say first off Brian and Vicki were wonderful to deal with. What they had told me about the location of the house and surrounding area was exactly right. 1 minute to the beach, and 3 minutes to the water park ! Had to deal with "Alberto" the first couple days but we just took the kids to indoor stuff and when the sun came out, BEACH HERE WE COME ! The water park was not there the last time we stayed at Ocean Lakes and was a great place to let the kids to enjoy. The house was decorated very nice and stepping out on the decks and seeing the ocean after a good night's sleep was amazing. Highly recommend this house for your family's vacation. Hope to stay again in the future! We enjoyed our stay here so much!! It’s a beautiful house... very close to the beach, and the owner was so nice! She is very accommodating and wants to make sure you have everything you need! Thank you for your kind words. It's was a pleasure hosting your vacation! We hope to see you again in the future. Historic Charleston South Carolina is a 1 hour 30 minute drive to the south, Ocean fishing charters in Murrells Inlet just 5 miles south, quaint communities of Surfside beach and Garden City Beach less than 1 mile to the south (Our family loves the 'older, simpler time' feel of these less crowded wide beaches with ocean piers and boardwalks!) Ocean pier fishing at both Surfside and Garden City Piers, several GREAT water parks within 3 miles!